17 October 1908: Entered the Army as a Fahnenjunker in 1. Ermländisches Infanterie-Regiment Nr.150. 7 May 1909-18 February 1910: Detached to the Glogau War School. 2 August 1914: Company Officer in the Replacement Battalion of Infantry Regiment 150. 16 August 1914: Transferred to the I. Bicycle Company Königsberg. 16 September 1914: Adjutant of the 9th Landwehr Brigade. 31 October 1914: Transferred back to the I. Bicycle Company Königsberg. 20 May 1915: Ordnance Officer on the staff of the 17th Landwehr Division. 1 March 1916: Company Leader in the 2nd Jäger Battalion. 2 June 1917-2 July 1917: Detached to the Sharp Shooting School in Wilna. 27 October 1917-22 November 1917: Detached for Machine Gun Training in Olita. 9 October 1918: Deputy Leader of the I. Battalion of Infantry Regiment 380. 21 October 1918: Again, Company Leader in the 2nd Jäger Battalion. 1 August 1919: Transferred to Reichswehr Infantry Regiment 21. 20 November 1919: Deputy Company Leader in Reichswehr Infantry Regiment 21. 3 January 1920-24 January 1920: Detached to Infantry Cannon Battery 21 for Machine Gun Assault Troop Training. 1 June 1920: Company Officer in the 2nd Machine Gun Company of Reichswehr Infantry Regiment 21. 5 June 1920-13 July 1920: Detached to the Railway Station Commandant of Gerstungen. 9 July 1920: Company Leader in Infantry Regiment 21. 1 October 1920: Company Officer in Reichswehr Infantry Regiment 110. 1 October 1921: Company Officer in Infantry Regiment 16. 6 October 1921: Transferred to the staff of the I. Battalion of Infantry Regiment 16. 17 January 1922-15 March 1922: At the same time, Deputy Adjutant of the I. Battalion of Infantry Regiment 16. 1 October 1922: Company Chief in Infantry Regiment 16. 14 February 1928-3 March 1928: Detached to a course for physical training at Wünsdorf. 1 February 1929: Transferred to the Commandant of the Ohrdruf Troop Training Area. 1 February 1933: Transferred to Infantry Regiment 15. 1 April 1933: Commander of the Training Battalion of Infantry Regiment 15. 15 October 1935: Commander of the II. Battalion of Infantry Regiment 57. 30 December 1941: Commander of the 416th Infantry Division in Denmark. 1 June 1943: Army High Command Leader Reserve and, at the same time, detached to the Dresden Army Recruitment Inspectorate. 8 May 1945-1947: Prisoner of war in British captivity. NOTE: Brabänder’s World War II decorations, if any, are not known. However, he was not a recipient of any high decorations such as the Knight's Cross of the Iron Cross, Knight's Cross of the War Merit Cross with Swords, or the German Cross in Gold/Silver. 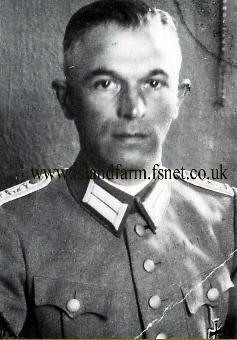 It is probable he received the 1939 Bars to his World War I Prussian Iron Crosses. 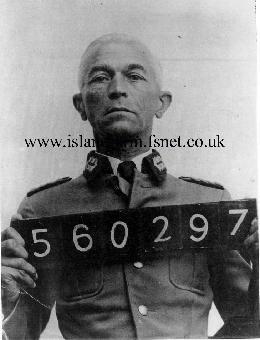 Click here to see a tentatively identified photo of Generalleutnant Hans Brabänder (Hans Brabaender) in the company of fellow prisoners of war at Island Farm.